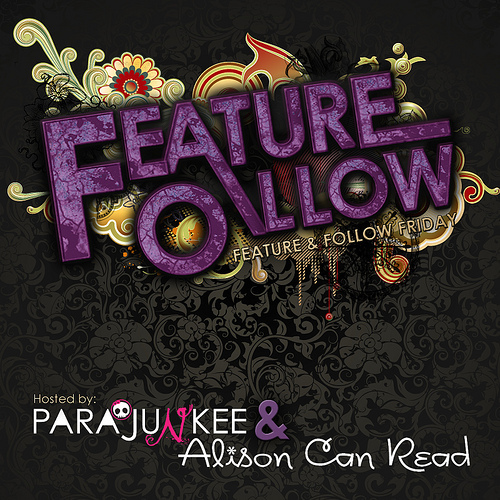 Feature & Follow is a blog hop hosted by Parajunkee & Alison Can Read. The purpose is to meet new people and gain more followers in the book blogging community. If this is your first time here, welcome! You are about to make some new friends and gain new followers — but you have to know — the point of this hop is to follow other bloggers also. I follow you, you follow me. It is still hot here in Australia, but in the afternoons I like to go out and sit on my back verandah and read. That way I can watch the kids play and relax in the afternoon shade. It is very peaceful.... Lol!! If you can call 3 kids screaming around the yard playing or riding motorbikes peaceful!! Haha!! To play along visit Parajunkee & Alison Can Read. Follow them, follow their Featured Blogs and then visit as many blogs as you can, posting your answer. And don't forget to leave your link in the comments section below! I know about the heat and I know about the kids. - well I've only got two, but sometimes, they make enough noise for three. I've still got a while until the heat increases. It sounds like a fun place to read at least! :) Thanks for following my blog, I'm now following back. Thanks for following and stopping by my blog! Aww another Australian! So jealous! Hi Nomi. You have a beautiful blog! I'm so glad I found you. I do love your fairy. I'm very happy to follow you and thanks for following me. I will definitely be back here. That sounds nice! I don't read outside myself. Warmer weather in St. Louis usually means it's too hot and humid. Or on the rare nice spring days, it means tornado weather is just around the corner, so that's not good either! Laughing children does sound wonderful. ;-) People are used to the sight of me reading while everybody around is in motion. I can't wait to have that heat, when I head to Australia in december! A verandah would be nice. How do you read and watch the kids at the same time? When I read nothing else exists. Old follower. Thanks for stopping by my #FF!